There is a story that is rarely seen on social and it is not the one that we tell between the syllables of what we do and why we started. But, it is a story that we have gotten into bed with and wrestled with like fighters in the ring. 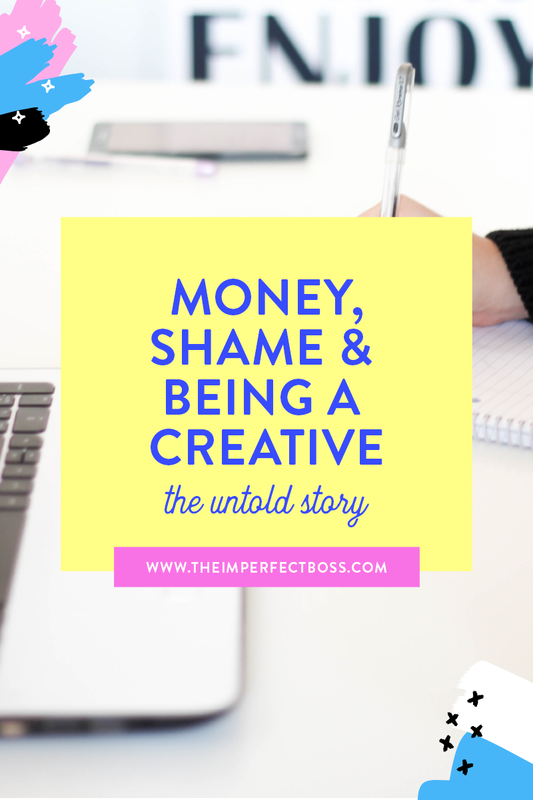 It is the story of how to make money doing your creative work. What happens when that isn’t easy, when that feels like a fight and when you stare at your bank account at the end of the day and see more red than you ever do black. Because in the midst of all this talk about six figures, leaving corporate jobs, and retiring spouses, there are some of us who are drowning in this sense of failure - that we must be doing something wrong, and that we are, in fact, something wrong. Now time-out, I am not saying that wealth is bad. Actually, it is really, really good and I champion creative women into abundance every change I get. But, I believe that when we don’t give space and voice to the seasons of life that are hard and left lacking, we isolate from one another. And I believe that isolation will dampen the fire of inspiration in a creative faster than anything else. Because when we feel alone, we feel vulnerable. When we feel alone, we think we are missing something within. When we feel alone, we bend under the cloak of shame that make ourselves smaller than we were ever born to be. So, we need to come out and say it, that in our legacies and trailing on behind these stories of success are not just what you see with the naked eye. That beyond what you see, we are the people who have stayed up at night making it happen over coffee and fiery dreams. We are the ones who have prayed for a miracle over ramen noddles and bottomless glasses of water. We are the ones who have swung between hustle and belief and rest like Tarzan in a humid jungle. What we are saying is that financial perfection is not normal. If that’s what you’ve been sold, you’re eating a poison that will unravel your dreams, and make you jaded. Because the truth is that it is not normal to make thousands on your first launch. It is not normal to be completely free of all fear when it comes to money. It is not normal to run into the arena and say, “i’m here!” and suddenly be given every dream you’ve ever wanted on that rose gold platter. What is normal is a journey that swirls around and goes up and down from the minute you say yes. What is normal is success and failure, abundance and loss, and confidence and fear. And we say this because the shame of you thinking you’re not where you need to be or that you are a failure in and of yourself will destroy you faster than not having the money ever could. Listen, I know that when the money isn’t there, everything else feels insecure. I know that selling yourself can feel like this rocky game of show-and-tell. I know that turning your most beautiful creative work into profit can cause the smallest of fears to rise in you like pasta in boiling water. And so, let’s quit the smoke shows and let’s talk about it. Because you’re not the only one. Even if that person you look up to is killing it and rolling in cash over there, they didn’t start there and they weren’t born there. Don’t let the appearance of their now convince you that it’s always been. Don’t allow the stress of not having money to take you out of the game. Don’t allow the comparison to convince you that you simply don’t have what it takes. Don’t allow the fact that no one is talking about the hard parts of money and creativity to nudge you that shouldn’t either. We are creative people learning to unleash our work into the world and make a living at the same time. We are wired for abundance, but we were never meant to be shamed into pretending we have it. So, yes, do your work and make the money. Make lots of it or make a little of it. Talk about when you succeed, but also talk about when you can’t afford rent. Show us the best and show us the worst. Because the more we can make the imperfect normal, the more free we all get. And, whatever you do, never surrender your gifts, because you’re afraid that you just won’t be able to make it happen. If anything, surrender your trust, that if you do the work, it will always happen. Ready or not.